Maniac Magee's favorite food is one detail I will always remember. It was ingrained in my mind in an embarrassing moment 25 springs ago. Because of that moment, I have never forgotten that Jerry Spinelli's fictional hero loved butterscotch krimpets. Is this an odd bit of trivia to keep in the back of one's mind? Yes. Yes it is. But there is a story behind it. I looked back in the archives to see if I've told you all this story before, and I haven't. I also noticed I frequently tend to start things the same way. So why change? In the 1991-92 school year I was in sixth grade. My family was located in what eventually became the Landstown section of Virginia Beach. Had we never moved to Western New York, I would have attended Kellam High School. As for elementary school, there were 32 in the city school district that year, or at least that was how many entered teams into the city-wide Battle of the Books competition. Students were chosen for Battle of the Books by their respective teachers. 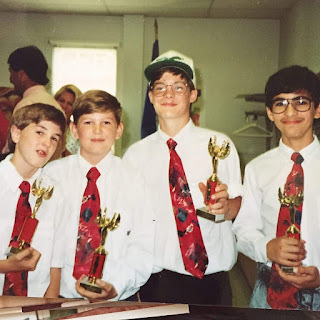 As a sixth-grader, I knew that I would have a chance to be among that group. However, when the members were selected in October, I was not among them. My teachers at that time, Mrs. Ashe and Mrs. Womick, knew who I was before the school year began. They knew I had been in the Young Readers group as a fifth-grader. And let's face it: teachers talk to teachers. A few weeks after the first Battle of the Books group was selected, I was staying after school one day because my mother was driving me home. (She worked at the school as an aide.) I wound up waiting in the library talking with the librarian. Shortly before Mom and I left, Mrs. Womick let me know that I was getting the Battle of the Books list, too. I honestly don't remember the conversation, and I don't remember (or care to know) if there was any convincing done on my mom's part to get me involved. It didn't matter to me, though. I was in! By now you're probably wondering, "What's Battle of the Books?" Summing it up, it was a competition that required sixth-grade students to read a pre-selected list of 58 books of varying lengthy from early October to sometime in the spring (April or May I believe). Schools then held contests with students making up teams of three, plus an alternate. Questions asked would focus on some detail of the story read, and teams would have to name the book. Bonus questions involved naming a friend of a main character, or an author, or a unique food, etc. I dove headfirst into the reading list, and by the time the contests rolled around I had read almost 50 of the 58 on the list. Considering I started a month late, that wasn't bad at all. When intra-school competition day arrived, I was ready. Matt and Kirk were ready. Ryan, our alternate, was ready. We felt confident. And when the battle began, we slowly developed a lead and we didn't let it go. We won! And on to the interschool competition we went, representing North Landing Elementary. Mrs. David and Mrs. Womick labeled our group "The Fearsome Foursome." Up to that time, the furthest a North Landing Battle of the Books team had gone was maybe one or two rounds in the citywide contest. Maybe they saw something in us. Maybe they knew something we didn't. I just knew my team and I were ready. We showed up ready for our first match in matching uniforms. Each of us was wearing a school sweatshirt, and underneath each sweatshirt was a school t-shirt. Yeah, we thought we were so cool. Then some time during the first match, Ryan psyched everyone out. He was too hot, I guess, so he took off his sweatshirt in one of the oddest, longest ways possible. I really can't describe it, for it was that awkward. The other teams looked on in disbelief because what he essentially did was give us a "fifth" team member. There was Matt, Kirk, and I at the main table, Ryan right next to us ready to steal any possible points, and Ryan's sweatshirt, good for intimidation. We navigated the first few rounds and made our way to the city semi-finals. As fate would have it, I knew some of the people from one of the other semifinal teams. When I saw them a few days afterward, they were pleasant, but you could tell they weren't very happy, because the Fearsome Foursome had won. We were going to the finals! Together, my teammates and I ultimately decided to change our look. We were going to be on television. Sure, it was local public access TV, but we were going to be on TV, and we wanted to look good! With that in mind, we decided to still wear our school colors, but to do so in style. So we went with the "preppie" look and wore white dress shirts with red "battle ties" for the finals. We were too young for superstitions. Another year later and the t-shirt/sweatshirt combo would have stuck. It had served us well to that point, so why change? As the finals approached against Malibu (yes, that was the other school's name), we drilled titles and authors and miscellaneous book facts with Mrs. David and Mrs. Womick. We wanted to win. They, of course, wanted us to win. And we had advanced far beyond any team prior to ours. Like I said, they knew something about us that we didn't. Sometimes we think we have disappointed our teachers or our coaches by not winning something we thought we could. Only years later do we realize that in some instances, winning truly did not matter to them as much as we thought. The finals against Malibu did not go well. We lost. It was close for the first two-thirds of the match, but Malibu was one of the best Battle of the Books schools in the city for a reason. Its team pulled away and won by a score of something like 115-85. During the contest, one of the bonus questions asked concerned Maniac Magee. The book had come out in 1990 and was taking the young adult literary world by storm. It was, and remains, one of the best books I have ever read. The question: "In the book Maniac Magee, what is Maniac Magee's favorite food?" I immediately buzzed in to answer. I knew this one. I knew this one! Then I froze. Kirk and Matt looked in my direction, expecting me to come through. But I froze. I probably was as pale as my white shirt. I thought, and thought, and thought some more as fast as I could in the time allotted to answer. Then I embarrassed myself. "Incorrect," said the moderator. "Malibu has a chance to answer now. Malibu do you have a response?" The Malibu team conferred. "Butterscotch krimpets," they said in unison. My face went from the white of my shirt to the red in my tie. On Facebook the other day, I made a playful comment about common sense on something Mrs. Womick had posted. She appreciated the fun remark, and her response included a reference to butterscotch krimpets. In my reply, I made sure to let her know that since that fateful day in 1992, I have always known that answer. After all, they say you only make certain mistakes once, right? I also noticed several testimonials written on Mrs. Womick's Facebook page. After taking the time to skim a few of them, I realized she was retiring after a long, rewarding career. And that's what led to my decision Friday morning. That, and a brief conversation with my mom during which she, too, laughed about the Maniac Magee reference. Google was great in helping me find the school and number to call, and shortly after 8 a.m. I got through to the main office. The person who answered asked for my name before I was put through, and instead of giving it I simply said, "I'm a former student, calling to wish Mrs. Womick a happy retirement." "I want you to know my son has now read Maniac Magee twice, and to this day I have never forgotten that Maniac's favorite food is, indeed, NOT apples, but is butterscotch krimpets." She knew exactly who it was. We spoke for a brief time, and by the end of the conversation I couldn't tell for sure, but it sounded like she was getting a little choked up. I hadn't intended for that to happen, but in a way it made me feel good. Teachers spend as much time with us as our parents and serve just as valuable a purpose. We always strive to make our parents proud, and you could argue that there are too many times our teachers get left behind. With the benefit of hindsight, though, we know they had just a big of an impact on shaping who we ultimately become. And they were likely just as proud of us. I called Mrs. Womick to say thank you. I used the phone instead of a Facebook post because I suppose I'm old school and I like to talk. I did it as a my way of doing good for someone else. The thoughts going through my mind as I dialed the numbers Friday boiled down to this: "She'll love hearing from a former student, right? Yeah, let's do this. Let's surprise her on her last day. She'll love it!" Based on the reaction I got over the phone, she did. So as another school year comes to a close, if you get a chance, thank a teacher. You'll be glad you did. Howie Balaban thinks teachers need to be allowed to teach creatively. That way, the next generation of students can have their own Mrs. Womick, or Mrs. Stamm, or Mrs. Wehmeyer, or, well, you get the point.